The Value Hardshell cases (CG-018) feature a 3-ply, cross-grained wood construction for strength. The top is slightly arched to give an added element of protection to the instrument inside. Four gold-plated latches and one lock keep the top tightly secured so players can feel confident about the safety of their instruments. The rugged plastic handle has a comfortable grip and is tightly riveted to the body of the case. The Guardian Value Hardshell case is covered in classic black tolex for a traditional, classy look. The inside of the case features luxurious grey plush lining, with multiple padding thicknesses for maximum safety and fit. Dense foam cushions the sides of the instrument, and medium density foam provides the cushion underneath. The accessory pocket has plenty of room to fit a strap, picks or a guitar tool. 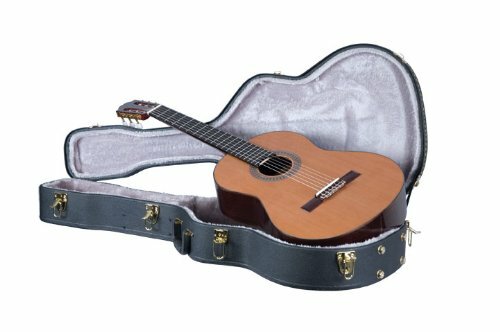 Case fits classical guitars only.